I am not actually a huge fan of coffee, but there is always something irresistible with tiramisu. The Italian word tiramisu can be translated in several ways to “pick me up” or “cheer me up” or “lift me up” and they all work for me. 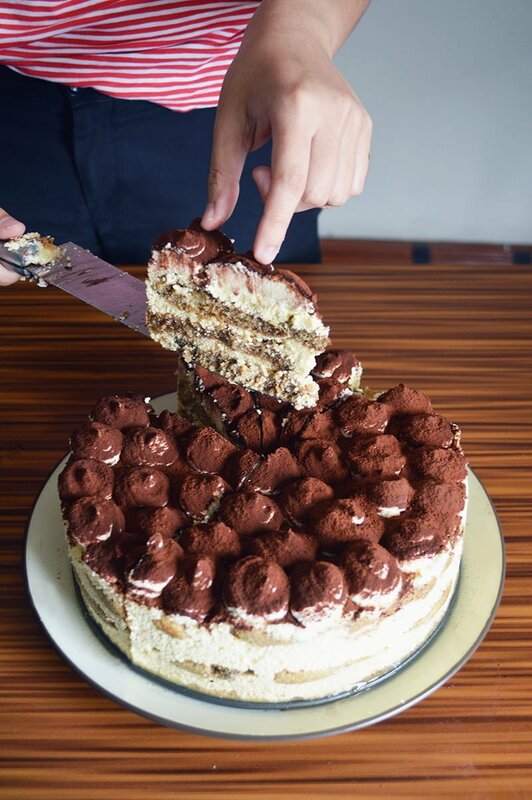 Tiramisu is a recipe of happiness for me whenever I am feeling down. Thankfully, making homemade tiramisu is so easy and you do not even need to bake it. 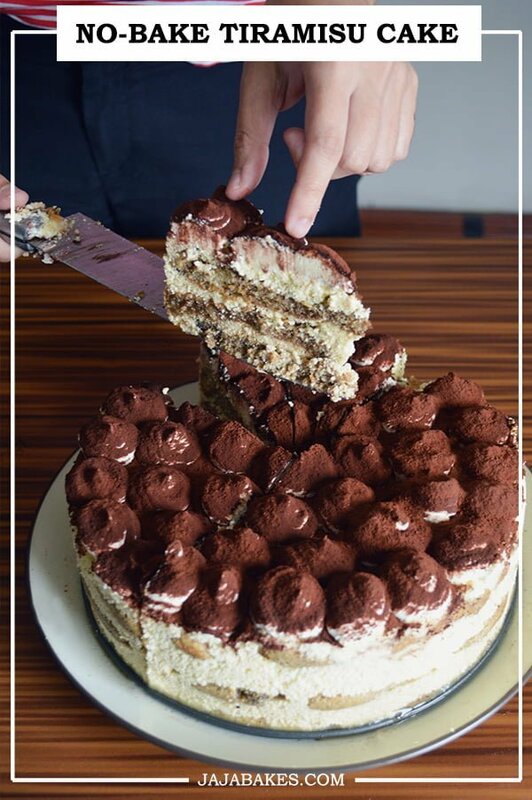 This recipe calls for light and subtly sweet tiramisu with rich mascarpone filling and layered with soft boozy coffee-soaked ladyfingers. It literally melts in your mouth. Traditional recipes use Marsala wine in tiramisu. If you are looking for a substitution, then dark rum is my favorite. You can also use brandy, coffee liqueur like Kahlua, or almond liqueur like Amaretto. If you want to make a non-alcoholic tiramisu, just leave the liquor out or try experiment with fruit purees to give your tiramisu an extra summery flavor. Coffee flavor plays a huge part of the unique taste of tiramisu. If you want to limit your caffeine intake or probably get worried about over-caffeinating your kids, you could consider using decaffeinated coffee instead. It is coffee from coffee beans that have had at least 97% of their caffeine removed. Traditional tiramisu is often prepared using raw egg yolks. Raw eggs may contain bacteria called Salmonella, which can cause food poisoning. Unless you can find pasteurized eggs at the grocery store, those are safe to consume raw. Just to be safe, I cook the mixture of beaten egg yolks and sugar on a double-boiler (bain-marie technique) just to heat the egg yolks without curdling them. The method does not require a special pot, but can be created by setting a heat-proof bowl on top of a simmering pot of water. There should be space between the water and the bottom of the bowl, instead the bowl is only heated by the rising steam. Mix vigorously until the custard thicken and triple in volume. Then, it’s time to pull from heat and let cool. Do not substitute mascarpone with cream cheese here when making tiramisu. While cream cheese is tangy, mascarpone is very smooth and buttery tasting. Mascarpone has a very high fat content and so will split more easily than double/whipping cream or cream cheese. Mascarpone does not need to be at room temperature, you can just leave it out of the fridge for a couple of minutes to soften slightly as it softens very quickly. If the mascarpone is warm then it is actually easier to over whisk it. Ladyfingers are just tender-crisp bites of dry sponge cake. Due to their porous nature, the ladyfingers quickly absorb liquid. It is important to dip and roll the ladyfingers briefly in the spiked espresso mixture so that it does not get too mushy, crumble, and fall apart. Once built, the tiramisu needs to chill for at least 6 hours before serving. The sponge cake will be absorb more flavor and the cream will set to a sliceable consistency. Just before serving, dust the top with matcha powder. 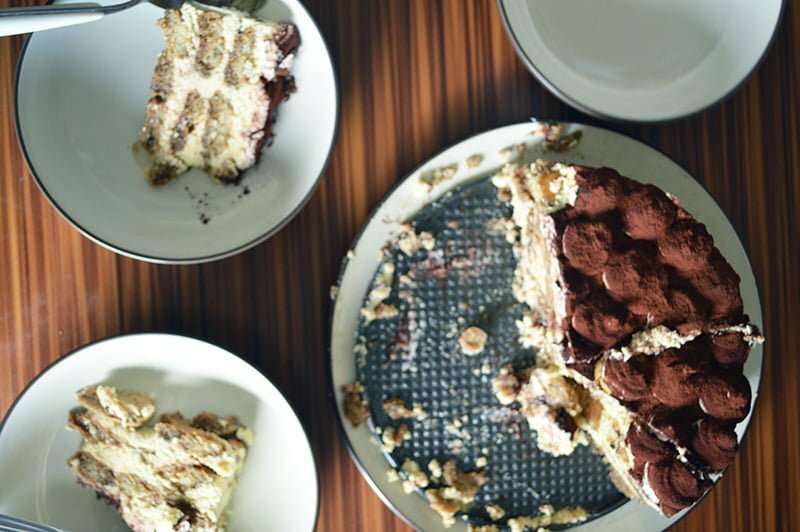 This recipe calls for light and subtly sweet no-bake tiramisu with rich mascarpone filling and layered with soft boozy coffee-soaked ladyfingers. Line the side of a 10-inch / 22cm round springform pan with baking paper or transparent cake side membrane. Stir strong coffee, sugar, and rum until sugar is dissolved. Set aside. In a heatproof bowl that rests easily in your saucepan without touching the surface of the water, whisk together the egg yolks and sugar until the mixture triples in volume, is pale, thick, and hot to the touch. Set aside to cool for about 15 minutes. Once egg yolk mixture has cooled, add the mascarpone and vanilla extract. Whisk the mixture until well combined. Then gently fold in the whipped cream in until smooth. One at a time, gently dip both sides of ladyfinger into the coffee syrup, then place in the bottom of the springform pan. Trim any ladyfingers as needed so that it fits in the pan. Top with about half the mascarpone filling, spread into an even layer. Repeat the process for the second layer. Chill for at least 6 hours to set. Pipe whipped cream on top if desired. Then dust with cocoa generously just before serving.